Last week I sat in a community hall in rural Japan, drinking sake and eating Australian beef. The local school choir sang, and toasts were proposed in honour of the friendship that exists between the Urata region and Australia. Around the walls stood local people wearing red aprons emblazoned with the word: “Aussie”. Unusually for an art-generated event, this evening was notable for its cheerfulness and total absence of snobbishness. There was no heavy-duty networking, no careerism, no opportunity for reputations to be made or unmade. It was simply an appreciation of Australia’s participation in a unique exhibition: the 4th Echigo-Tsumari Triennial. Spread out over 700 square kilometres, incorporating almost 280 artworks, the ETT covers the greatest area of any international exhibition. Visitors may buy a ticket in the shape of a passport for Y 30,000 and drive from one display to the next, or take one of four separate bus tours. The truly dedicated can join all four tours, with four different itineraries. After two days on buses I had seen no more than one tenth of the show, but to see everything would require the best part of a fortnight. The ETT is remarkable not simply because of the vast area it encompasses, but because so many venues feature multiple artists and installations. For instance, an old school, rechristened Fukutake House, after the chief sponsor and producer of the Triennial, Soichiro Fukutake, is worth one small stamp on your passport, but contains room-sized works by numerous artists or groups of artists. It ultimately becomes hard to calculate the number of participants or their countries of origin. The previous ETT included 330 artists from 47 countries, and this year it is bigger. Another unique feature is that a certain percentage of works made for the ETT will remain as permanent installations, maintained by volunteers in the community. It is almost impossible to imagine this occurring in Australia, where vandalism is a national pastime. The process begins when a venue, usually an old farmhouse, is purchased by a private or corporate sponsor and donated back to the community in its altered form. These deals are brokered by Art Front, Tokyo, a private gallery and exhibitions agency run by the charismatic entrepreneur Fram Kitagawa. Even allowing for the financial crisis, Art Front has been able to fund this year’s show entirely through private and corporate means. Once again this would be virtually inconceivable in Australia. This may seem wondrous enough, but perhaps the most extraordinary feature of the ETT is its utopian ethos, which aims at a revitalisation of the region through art. 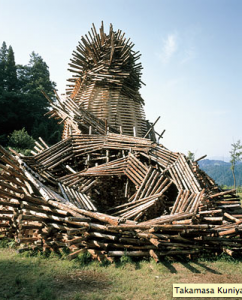 The first step came in 1996, when Kitagawa was approached by the authorities of Niigata Prefecture, to do “something creative”, which would help facilitate the merger of towns in a rural area of north-western Honshu. The new Echigo-Tsumari region was created from the union of six smaller towns in Japan’s famous ‘snow country’. In the humid summer months it is a fabulously scenic place – a vision of mountains, streams and winding roads, interspersed with brilliant green rice paddies and traditional farm houses. During winter it enjoys the highest snowfall of any inhabited area at this latitude. It is not unusual for the ground to be blanketed with three or four metres of the white stuff, cutting off contact with villages and farms for weeks at a time. This is the setting for Yasunari Kawabata’s novel, Snow Country (1947), which tells the story of the doomed love affair of a city dilettante and a country geisha, against a backdrop of frozen beauty. The sadness and loneliness that feature so persistently in Kawabata’s work reach a kind of perfection in this setting, where people have been battling with Nature for more than 1,500 years. Nowadays the region is no less beautiful, but loneliness and sadness are the result of economics rather than metaphysics. The world has changed so rapidly that age-old patterns of living have begun to crumble. More than half the local population is over the age of 65, with young people leaving for the cities as soon as they are able. The new generation feels no attraction for the back-breaking labour of tending small rice paddies in a manner that is no longer viable. The visitor might never suspect – while looking at the immaculately tended houses, roads, fields, vegetable plots and flower beds – but the region is seriously depressed. The schoolmistress at my dinner table in Urata was the principal of a school in which nine teachers looked after fourteen pupils. Within four years she anticipates there will be only eight pupils. 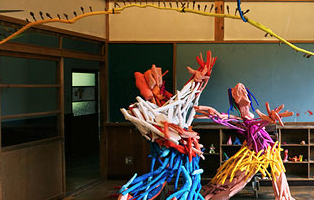 Another school, now converted into a riotous sculptural installation based on the works of story-book artist, Seizo Tashima, had only three pupils left when it closed. They are commemorated by coloured wooden effigies on the side of the building. It took Kitagawa four years and more than 2,000 meetings to persuade the skeptical locals that salvation lay in the form of an enormous art exhibition. Initially they were distrustful of people from Tokyo, let alone artists, but the curator stuck to his task and the first ETT was held in 2000. Nine years on, the momentum is unstoppable. Although the permanent population continues to dwindle, the ETT has brought a huge influx of visitors and much-needed capital. Furthermore, it has created communities that welcome artists from all over the world and are happy to assist them with their projects. In his speech at the opening ceremonies, Soichiro Fukutake expressed the hope that the ETT had shown how art could resurrect communities, change Japan and change the world. 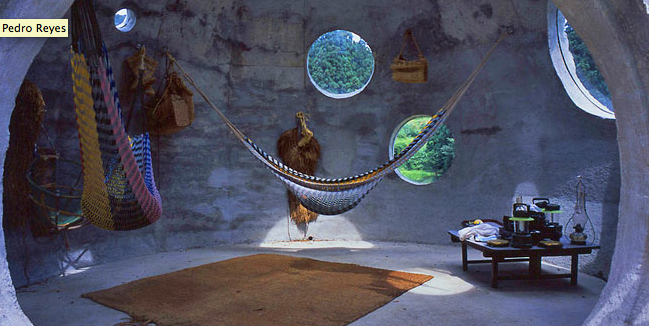 As major sponsor he has put his money behind these ideals, as he has done the with the island of Naoshima, which represents the world’s most refined symbiosis of contemporary art, architecture and Nature. Fram Kitagawa is also the director of the Chichu Museum on Naoshima, and will combine with Fukutake next year on another art festival, intended to revitalise the Seto Inland Sea area. The artists participating in the ETT have responded to the aims of the exhibition in diverse, creative ways. 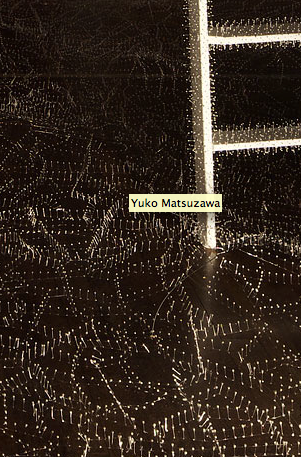 This includes installations by Antony Gormley and Chiharu Shiota, who have both chosen to fill old houses with taut networks of string, in a variation of an old Marcel Duchamp idea. In the suburbs, Janet Cardiff and George Bures Miller have created an artificial thunderstorm that may be experienced within one room of a house, complete with thunder and lightning, and drips being caught in buckets. 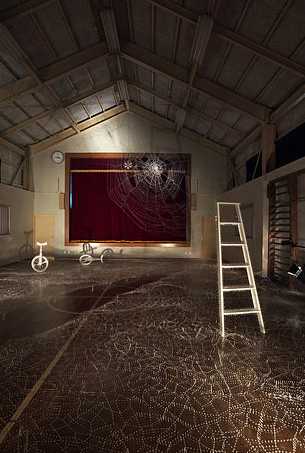 Perhaps the most spectacular pieces are the large school houses transformed by Christian Boltanski and Seizo Tashima into multifaceted installations: the first being dark and elegiac, the latter a fantasy realm of wooden monsters lurking in corridors, passing through walls, and dangling from ceilings. 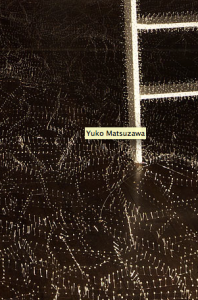 Even more broad-ranging is Katsuhiko Hibino’s Day After Tomorrow project, in which a colony of young volunteers publish a newspaper, make sculptures, grow Morning Glories on a commercial basis, and participate in a soccer match on a muddy field. One of the reasons the Australians were being toasted so lavishly in Urata, was that the Australian embassy, in collaboration with the Australia-Japan Foundation and Asialink, have rented an old farm house, in which three artists – Lucy Bleach, Richard Thomas and Alex Rizkalla, along with project manager, Cass Matthews, have lived and worked for weeks among the local community. The newly christened Australia House is set to become a permanent feature of the region. It has been much appreciated that Australia, alone among all participating countries, has had such direct embassy involvement. The entire cost of this exercise represents a fraction of the funds lavished on events such as the Venice Biennale, and the good will generated is incalculable. One can see how intimate the connections have become when one looks at Lucy Bleach’s installation, in which she took wax casts of the ears of her neighbours, and exhibited them as butterfly forms inside a small household shrine. Her co-exhibitor, Richard Thomas, passed long poles through the outside walls of the house that converged at a central inner point, while Alex Ryzkalla created an installation of Japanese bric-a-brac, sourced mainly from junk shops in Melbourne. Running concurrently with this year’s ETT is yet another Fram Kitigawa project, the Niigata Water and Land Art Festival, which incorporates a mere 80 artworks, spread out over all over the district. 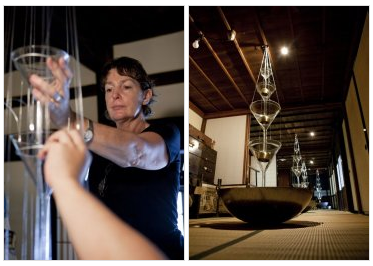 It includes a contribution by another Australian artist, Anne Graham, who has created an installation in an abandoned house in a remote hamlet by the sea, in which visitors are invited to pour a rough powder through a contrivance of metal woks and glass beakers, to generate a ‘singing’ sound. Niigata is a big city, but it shares the “revitalising” ambitions of Echigo-Tsumari. Its impressive art festival was organised in little more than three months, on the initiative of an energetic mayor. With dedication and a vehicle, one might be able to see it all in three or four days. In a more realistic vein, most viewers to Niigata will do what they do in Echigo-Tsumari: linking the unpredictable attractions of art with the more reliable pleasures of the Japanese landscape, the cuisine, the spas and the shopping. An added attraction is the knowledge that one is contributing to a greater ecology: the regeneration of the area, if not the planet. In Japan they don’t simply say this, they believe it. On that foundation of belief a framework of success is gradually taking shape.